Allergen Information: Contains Wheat, Soy Bean, Milk, Sulphite. Ingredients: Wheat Flour (40%), Sugar, Palm Oil, Cream (Soy Bean Oil, Butter (Milk)), Emulsifiers (E472g, E477), Antioxidant (Vitamin E), Colour (E160a(ii)), Milk Powder, Salt, Raising Agents (E503(ii), E500(ii)), Emulsifier (E322), Flavouring, Stabilisers (E1101(ii), E129). 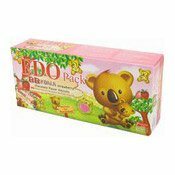 Simply enter your details below and we will send you an e-mail when “BB Koala Strawberry Chocolate Flavour Biscuits (草莓夾心餅)” is back in stock!